What to do when you get alerts? Acknowledge – Pressing this button will let other Supporters know that someone from your group is on it. All registered supporters will receive both a notification on their phone and an SMS. Just make sure you are definitely going to take care of it if your press this button. Resolve – Pressing this will let other Supporters know that the issue has been resolved by someone within the group. Pressing this button will send both notification and SMS to all supporters to let them know everything is taken care of. Press this button only if you have indeed resolved the issue. Call the Lumin Screen - The red call button will let you call the screen directly. 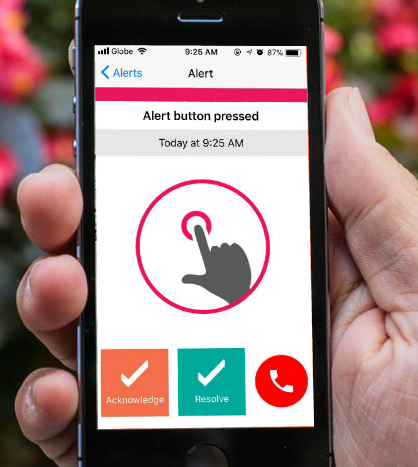 In these emergency situations, the Lumin screen will go into auto-answer mode which means the user does not have to go to the screen to accept the call.